News and Events: Ideally, How Much DNA Should Be Used For Gibson Assembly® Cloning? One of the advantages of cloning with the Gibson Assembly® method is that unlike other kits and cloning methods very little starting material is needed. For Gibson Assembly® reactions, we recommend combining insert(s) and vector in a molar ratio of 1:1, using 10–100 ng of each DNA fragment. The only exception is that for combining large DNA fragments over 32 kb in length with the Gibson Assembly® Ultra kit, you may need to increase the amount of DNA up to 300 ng. Assume you have a 2.7 kb vector at a concentration of 25 ng/µL and three DNA fragments with insert sizes of 750 bp, 1.2 kb, and 2 kb. In this example you would want to use the recommended vector to insert ratio of 1:1 for the 1.2 kb and 2 kb insert. For the 750 bp DNA fragment a 1:5 vector to insert ratio should be used as SGI-DNA scientist recommend a 5-fold molar excess when using fragments < 1 kb. Assume for your Gibson Assembly® reaction that you will use 25 ng of vector. 0.014352 = pmol / µL. Next, calculate for each fragment, solving for X.
Repeat these steps for each DNA fragment. You should get 34.7 ng for a 750 bp fragment (remember, this is a 5-fold increase) and 11.1 ng for a 1.2 kb fragment. Sum for the vector and DNA fragments, the total amount of starting material should equal 89.3 ng. Now, combine the inserts and vector DNA and initiate the assembly reaction. For optimal cloning reactions with the HiFi 1-Step and Ultra kits, the starting DNA fragments will be at a minimum concentration of 40 ng/µL. DNA concentrations of 20–25 ng/µL are acceptable, but efficiency may be reduced. For more dilute samples (10–20 ng/µL), we offer the same convenient assembly procedure with consistent and high cloning efficiencies using the Gibson Assembly® HiFi HC 1-Step kit. The Gibson Assembly® HiFi HC 1-Step kit (HC kit) contains the same components as the HiFi 1-Step kit in a formulation that allows for even more dilute starting material. The introduction of the HC kit to the SGI-DNA Gibson Assembly® suite of high-efficiency assembly products offers users greater flexibility for a wider range of starting DNA concentrations. With all of our Gibson Assembly® kits and Master Mixes, cloning relies on homologous overlapping ends between adjacent fragments. Once overlapping fragments are combined in the proper ratios and volumes as outlined above, they are combined with Gibson Assembly® reagents and incubated. During incubation, the Gibson Assembly® reagents mediate the generation of compatible ends, annealing, extension, and ligation to create a fully assembled seamless DNA construct. Seamless DNA assembly of small amounts of starting material DNA with SGI-DNA Gibson Assembly® kits. 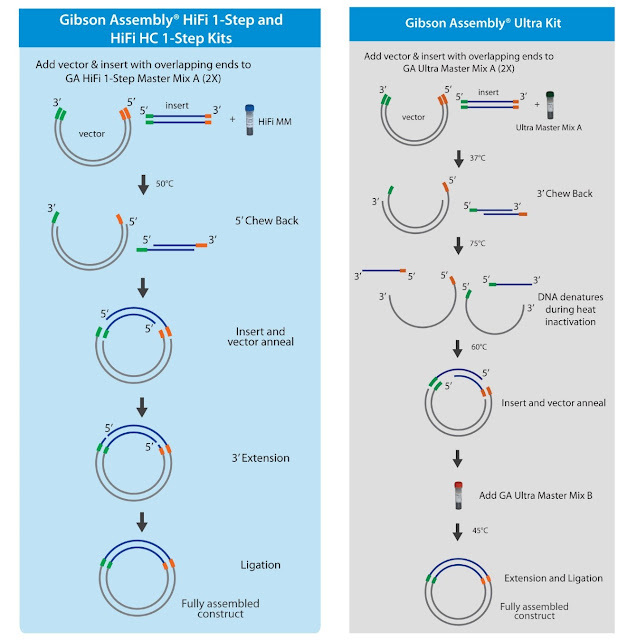 Visit SGI-DNA's web page to learn more about Gibson Assembly® kits and download an electronic version of SGI-DNA's Gibson Assembly® Guide to learn about all the ways you can get #DNAMYWAY. Gibson Assembly® is a registered trademark of Synthetic Genomics Inc.
Gibson Assembly US Patent Nos. 7,776,532, 8,435,736, and 8,968,999. Like reading your posts, keep updating. I am currently on the reads and research about DNA and this is definitely one of the topics needed for my paper. For an additional topic I may be needing some college papers for sale on the same topic. This topic is so extensive that is why may be needing all the advanced research on this.